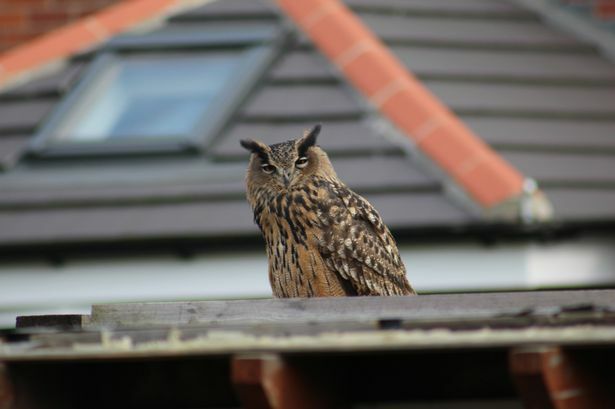 A rare Eagle Owl was spotted perching on a roof in Wallsend, North East England. Garry Smith saw the bird in his garden on Monday lunchtime. The eagle owl is one of the largest species of the bird and can have a wingspan of up to 74 inches. It is regarded as one of the most ferocious birds , known to be intolerant of sharing their territory with other birds of prey and owls. They are known to hunt rabbits and pheasants, but little is known about what else they eat in Britain. It is not considered a British species as it is a danger to some of the country’s own birds of prey, such as Hen Harriers. Despite that, it remains a protected wild bird. Garry warned his neighbour not to let his cats out while the bird was in the garden, but said it flew away after someone nearby began made a loud noise.